Yes, it’s about time I did. I hate to ask people to play cards with me. Always have. Even after 25 years of partnership, I don’t really like to call Mike and ask him to play. That’s all my fault, not his. But if you want to play, and play with better partners, you just have to grow up, put on your big boy pants and do something about it. Tuesday, Gail had a meeting at the Ruth Bancroft Garden, so she cancelled our regular game at Redwood. What to do, what to do? Finally, after years of dithering, I bunched up my nerve and sent an email to someone I’ve always wanted to play with. Imagine my glee when I got a note back that he would love to? Sort of an angelic backlight, don't you think? I’ve liked Hugh Ross, and admired his game, as long as I can remember. Recent health problems have caused him to retire from top-rank competition, but he still enjoys the game, and would like to get out a little more, too. I picked him up at his home in the Oakland hills and we sped off to the club. People were impressed. Micky B. bribed the director to skip us. 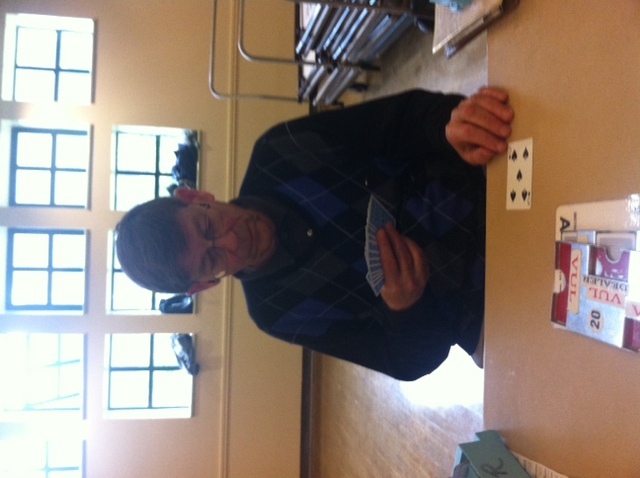 Playing with Hugh is a dream–he is the nicest of partners, and his play is astounding. I saw defensive moves I’ve never seen before. I watched him balance with 4 points because he knew it was right. There is just so much I have to learn. Mike Lawrence was the first person Hugh met when he moved here from Montreal in 1962, and they have been partners and friends ever since. I told Mike I had a game with Hugh, and he told me how much I was going to enjoy it. He was right. There are drawbacks to playing with a world-class partner–if we get a bad board everyone thinks it’s my fault, if we get a good board he gets all the credit. I can live with that. I can live with the stunned looks on people’s faces when they see who I brought, too. Our game was just average–a couple of slips, the bad luck of having Ron Kow and Danny Scarola at the table for the round where EW have two cold slams–which they bid, of course. New partnership miscommunication. Nerves (mine). I had a great time. Hugh enjoyed himself, and says he’s willing to do it again. That growing up and doing the things you’re afraid of pays off, I guess. Now they tell me.